Hear Jubilee director Jonny Hanson share the vision and plan for Jubilee Farm. Jim Kitchen, sustainable food and environmental advocate. 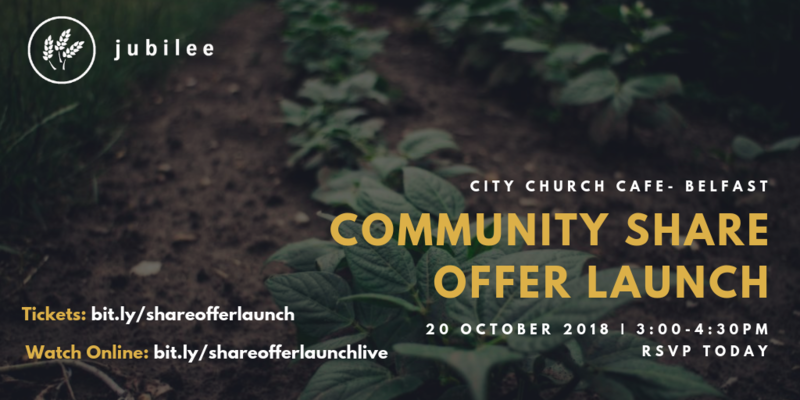 Join us as we launch our community share offer. Connect and Network over Fairtrade tea and coffee. We need your help to make this vision a reality. Book a ticket for our share offer launch here. After our initial launch in Belfast on 20 October, Jubilee will be in Dublin on 29 October 2018 to talk about this exciting project and how you can get involved.